Looking down on the southern half of the park from 325 Kent Avenue's rooftop amenity deck. 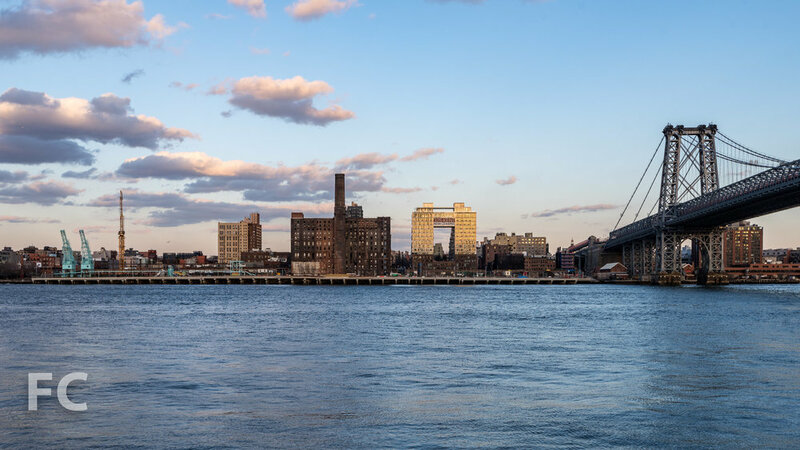 Brooklyn's Williamsburg neighborhood, the most underserved area for open space in the city, will soon have a new waterfront park. 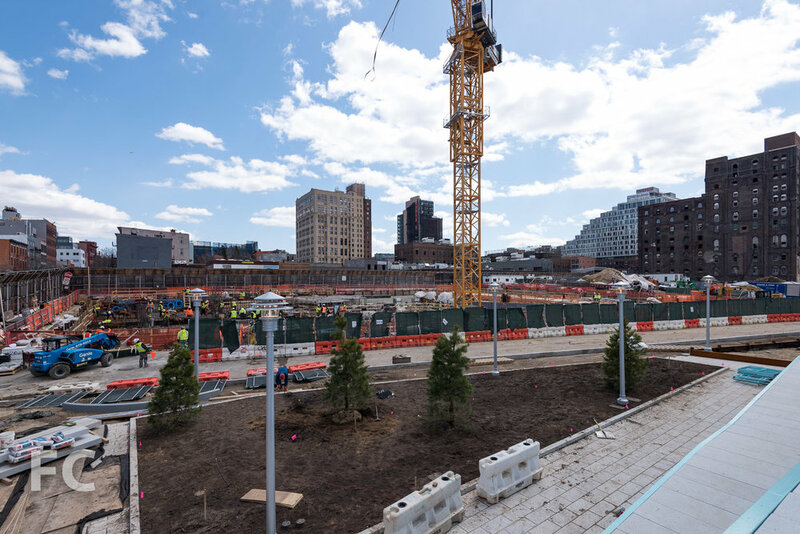 Developed by Two Trees as part of their 11 acre Domino Sugar development, the 6 acre Domino Park will open this June and provide a 1,200 foot long waterfront esplanade adjacent to four new residential towers and the renovated refinery building. The linear waterfront park is divided into three distinct programmatic areas: an active recreation space to the south, a central gathering space at Water Square, and a passive northern zone that includes an artifact walk incorporating items from the site's former industrial use. Southern half of the park from 325 Kent Avenue's rooftop amenity deck. 260 Kent Avenue on the rise at the northern boundary of the park. Rooftop amenity deck at 325 Kent Avenue. Looking up at the refinery building from Water Square. 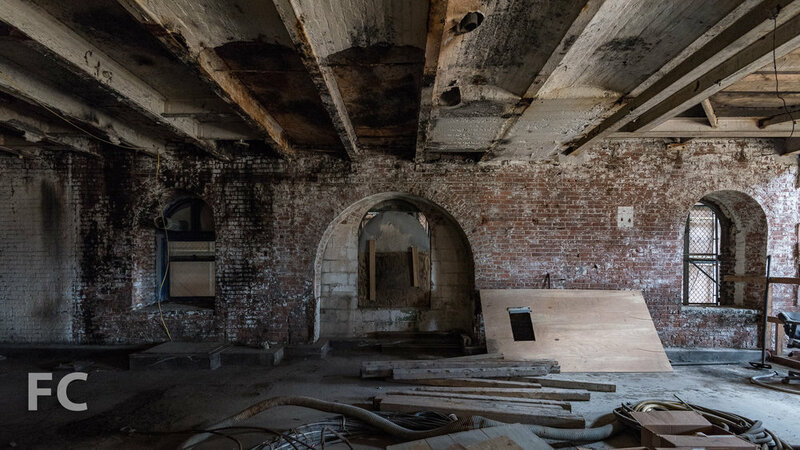 Inside the refinery building before renovation begins. Crane platform and elevated walk. Elevated walkway to the gantry cranes. Looking at the site of 260 Kent Avenue from the elevated gantry crane walk. Domino Sugar site on the East River waterfront. Northern half of the Domino Sugar site with the crane for 260 Kent Avenue (center). Landscape Architect: James Corner Field Operations; Architect: SHoP Architects (327 Kent Ave), COOKFOX Architects (260 Kent Ave); Developer: Two Trees Management; Location: Williamsburg, Brooklyn, NY; Completion: 2019 (260 Kent Ave), 2018 (Park), 2017 (325 Kent Ave).